The Pennsylvania is hosting Hooked on Scouting events on September 29th for all our new Scouts that joined Cub Scouts from July 1 to September 29. Hooked on Scouting event is coming Saturday, September 29th from 10 am to 1 pm. We have 2 locations chosen, Camp Mack (lake has been stocked! ), and Muddy Run for units on the Southern end. There will be a Radio station at each location, along with the PA Fish Commission, Trout Unlimited will be at Camp Mack, and numerous stations set up to teach our new Scouts how to set their fishing pole up, what’s needed in a tackle box, proper baiting, and a table with many resources for the scouts, and their family members to take home. Locations: Camp Mack, 2 Scout Lane, Newmanstown. Participants will be directed to the parking lot and shuttled to the lake. Cost: Free to all new Scouts and their families! 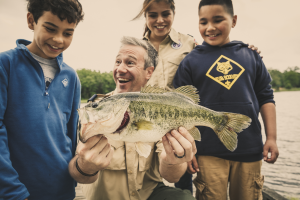 Hooked on Scouting is our fall recruitment campaign designed specifically to capture Cub Scouts earlier, invite them to participate in a fishing event to excite them and keep them longer. Success relies on a three tiered approach, but starts with excited units. There are few things that are more fun than a fishing! Council wide packs will have an opportunity to participate in a local fishing event. These events are staffed with volunteers and professionals that will help the Scout learn to fish. For the boys, it gives them an event immediately after signing up for Scouting and for us, well the reward is more Scouts in the program! Every new Scout who turns in a membership application between July 1st and October 1st will receive a brand new rod & reel! Get all of the information about this year’s Hooked on Scouting campaign here!